Quebec International and the Board of Trade of Metropolitan Montreal are proud to unveil the names of the 23 companies that will be taking part in the second edition of Passeport PME (Passport SME). This 18-month training and assistance program is geared towards locally based small and medium-sized enterprises with the potential of breaking into foreign markets. A total of 23 companies made it through the initial selection process, including eight from Eastern Quebec: Consulair, Dectro International, Fumoir La Fée des Grèves, Jyga Technologies, Machitech Automation, NovAxis, Produits métalliques PMI and Triode. Western Quebec will be represented by 15 companies: 1,2,3 Certification, Ateliers Kollontaï, Bestar, Dans un Jardin, Cyclone Lighting, FX Innovation, GGI International, Delom Group, Hygie, Judith & Charles, K2 Geospatial, Kinova Robotics, Palmex, Procad Consultants and TechFab. Partners of the Passeport PME 2013. Following a call for applications, the companies were jury-selected using the following criteria: the competitive advantages of the companies and their products/services, their financial capacity/resources, the commitment of their management teams and their international development stage. “These 23 dynamic and committed companies have demonstrated that they have the ambition, attitude and talent they need to achieve business growth in foreign markets. We are convinced that their competitive advantages, combined with the training, assistance and access to international partners that we offer, will enable local entrepreneurs to boost their profile in new markets,” said Michel Leblanc, President and CEO of the Board of Trade of Metropolitan Montreal. 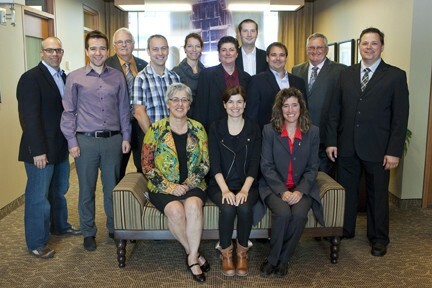 The eastern Québec companies selected for Passeport PME 2013. “Since it was founded in 1859, National Bank of Canada has provided thousands of companies with start-up, growth and international marketing assistance. NBC is proud to be helping the new generation of exporters through its association with the second edition of Passeport PME. I would like to congratulate all of the entrepreneurs who applied,” said Jacques Deforges, Senior Vice-President, Commercial Banking and International, NBC. Over the course of the 18-month program, the 23 companies selected will benefit from a comprehensive and structured training and assistance program with a potential value of $25,000. The related activities are organized by teams of international trade experts from the Board of Trade of Metropolitan Montreal, the World Trade Centre Montreal and Quebec International. Passeport PME is made possible with the support of National Bank of Canada; the Caisse de dépôt et placement du Québec; Quebec’s Ministry of International Relations, Francophonie and External Trade and its Export-Quebec unit; and our advisory partner, Raymond Chabot Grant Thornton. The initial results of the Passeport PME program speak for themselves: 22 trade missions involving a dozen countries, over $8 million in actual and future sales, six foreign subsidiary implementation projects, five industrial agreements concluded or under negotiation and 10 sales intermediaries identified worldwide. “The results of Passeport PME’s first edition confirm that the innovative approach developed within this program is relevant and effective. By defining a tailor-made service offer based on the specific goals of each company, we can maximize the chances of success. We firmly believe that local companies have extraordinary development potential and that if they have access to the right services, specialized resources and adequate financial support, they will shine on the international stage,” said Carl Viel, President and CEO of Quebec International. For further information on Passeport PME, please visit www.passeportpme.com. The Board of Trade of Metropolitan Montreal is made up of some 7,000 members. Its mission is to represent the interests of the business community of Greater Montreal and to provide individuals, merchants and local businesses of all sizes with a variety of specialized services to help them achieve their full potential in terms of innovation, productivity, and competitiveness. The BTMM is Quebec&apos;s leading private economic development organization.